Standing on a crossroads, the large box-like church dominates the skyline. From the back, it's a relatively ugly building, but as you come round the front, the neoclassical portico and steeple more than make up for first impressions. This frontage is the only original part of the building (built in 1824 on the site of an old gallows) after it was bombed in the Second World War. Inside, there is a noticeable lack of windows, though it isn't gloomy. 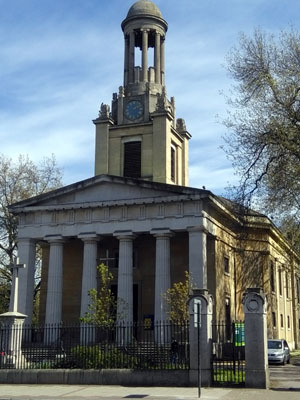 The church was one of four "Waterloo" churches in London, each named after one of the gospel writers. Their first vicar later went on to be the Bishop of Chichester. The church today runs several ministries including home groups, youth Alpha, and its own football team. Along with other churches, they are also involved in the local Robes project, which provides winter shelter for the homeless. Some parts of Kennington are undergoing gentrification, but it remains a notoriously rough area of inner city London. Just a week before my visit, someone was stabbed in a street brawl and a month earlier a police officer was deliberately run over just yards from the church. The grounds of the church are often used by drug addicts, according to some of the local homeless people. In stark contrast to this, just opposite the church stands the cricket ground called The Oval, scene of the first ever international test match to be played in England. Alongside the church sits Kennington Park, scene of many a march and rally, from John Wesley and George Whitfield through the Chartists and up to the modern day movement known as Reclaim the Streets. The service was led by the vicar, the Revd Steve Coulson, who also preached. Very sparse. I counted 25 people. There was a sign on a chair instructing people only to sit on the right hand side and near the front. Only the first part of this instruction was heeded. As I came in, someone was inserting notice sheets into, and then stacking, Bibles. I hovered by them for a few seconds before they noticed me, whereupon I was handed the bundle and invited to have a drink of tea or coffee that was being served over on the right hand side. We had some lovely padded chairs. They were quite reminiscent of those commonly found in Baptist churches, only without the little holes drilled in the wood for individual communion cups. Fairly quiet. Those who were sat in their seats were mostly silent, while at the back of the church, those who were having tea and coffee were chatting. "Good evening, everybody. Welcome to St Mark's." The songs were projected on a high screen. The small amount of liturgy for the communion was printed on a laminated sheet and we read from Today's New International Version of the Bible. Mostly keyboard. Someone was holding an electric guitar, but until the last hymn, I wasn't sure if it was actually being played. There was a drum kit set up but unused. A nearby clock tower started chiming, which broke into the service. There was a chap sat behind me who was in dire need of blowing his nose, but he just sat there making wet, bubbly sniffing noises. For an Anglican church, this was fairly low down the candle and unthreatening. No processions, smells or bells, and very light on the use of liturgy. The vicar wore nothing more elaborate than a simple pale clerical shirt with collar. The sung worship was a mixture of fairly modern choruses with a couple of classic hymns. 8 – The vicar spoke as if he was in a bit of a hurry. At the start, I wasn't impressed by his exposition of the scripture, but I warmed to him as he got to the meat of his sermon, which was rather well crafted. At a couple of points he asked for congregational participation by posing questions for us to answer. Judgmentalism. Taking as his text John 8:1-11 (the story of the woman caught in adultery), the vicar explained that it wasn't the woman on trial, but Jesus. Media and police had been judgmental against the citizens of Liverpool in a certain notorious football melee several years back, but in like turn, many citizens had then been judgmental against the media and police. Such judgmentalism is a self-righteous knee-jerk reaction. But instead of telling people not to judge, perhaps it is better to lure them toward grace. The final hymn, "How Great Thou Art," was sung with a huge amount of gusto that gave me the impression this small gathering of saints were singing what they truly believed, clung to and found their identity in. At several points during the reading and the sermon, there was a loud sort of crackling from the microphone. It wasn't quite the squeal you get with feedback, but it was loud and unpleasant enough to make one wince slightly. I sat and earwigged in on a couple of conversations around me, particularly one between a long-standing member of the church talking to a fellow newcomer. As no one came over, I went over to the coffee and was invited into conversation with a few people, who asked me how I came to be there. On my way out, I met a homeless man sat on the steps of the church and had a very different conversation with him. It was an instant coffee in a stout mug. Bland but not offensive. There was also a nice selection of biscuits and cakes on offer. 8 – I'd like to try a morning service to compare, but I'd definitely come back here for another evening service. For a nonconformist, this is the kind of Anglicanism one can call home. The warm and welcoming attitude of the congregation.